Thane Rosenbaum’s Wall Street Journal op-ed: This New York University scholar—like Osama Bin Laden—thinks civilians can be legitimate targets. This New York University scholar believes Palestinian civilians are legitimate targets because Gazans voted for Hamas. 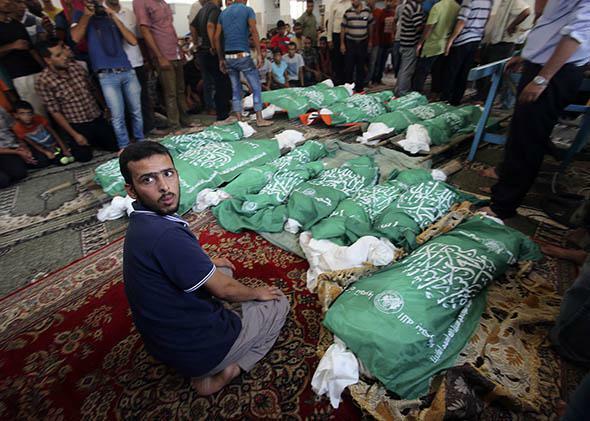 A man sits next to the bodies of Palestinians from the Abu Jama’e family, who medics said were killed in an Israeli airstrike that destroyed their house, during their funeral at a mosque in Khan Younis in the southern Gaza Strip on July 21, 2014. If there’s a single thing that separates legitimate warfare from simple terrorism, it’s the effort to distinguish civilians from soldiers, and combatants from noncombatants. That’s not to say that noncombatants don’t die in “legitimate” wars, or that states don’t accept civilian deaths as a matter of course. At the same time, it matters that those actions aren’t war aims—that states are trying to distinguish between combatants and noncombatants. [T]he American people are the ones who choose their government by way of their own free will; a choice which stems from their agreement to its policies. Thus the American people have chosen, consented to, and affirmed their support for the Israeli oppression of the Palestinians, the occupation and usurpation of their land, and its continuous killing, torture, punishment and expulsion of the Palestinians. The American people have the ability and choice to refuse the policies of their Government and even to change it if they want. For both Rosenbaum and Bin Laden, the situation is straightforward: Because a majority of Gazans/Americans voted for leaders who used violence or waged war against Israelis/Muslims, both have forfeited their claim to noncombatant status. After all, if they wanted to avoid conflict, they wouldn’t have elected those people in the first place. If you recoil from this logic, your head is in the right place. By any standard, it’s perverse and morally wrong—a justification for the worst atrocities. What’s more, it’s based on the faulty assumption that there are no innocents in a democratic polity—that all individuals, from aid workers and conscientious objectors to children and the disabled, bear responsibility for every action of their government. If this were true, then the logic of Rosenbaum and Bin Laden would make sense, and everyone would stand as a legitimate target in armed conflict. It should be said that Rosenbaum isn’t the only person to make this argument in the context of the Israel-Palestine conflict. In 2006, another law professor—Alan Dershowitz—took a somewhat softer line in arguing that we should have a “continuum of civilianality” that distinguished “the truly innocent” from the “guilty accessories to terrorism.” Dershowitz wasn’t as cold-blooded as Rosenbaum—sketching a difference between “a civilian who merely favors or even votes for a terrorist group and one who provides financial or other material support for terrorism” that Rosenbaum doesn’t abide—but even his logic is disturbing in its permissiveness toward broad-based violence against a population. One last observation: In 2001, just after Sept. 11, University of Colorado professor Ward Churchill wrote an essay defending the attacks and disputing the innocence of the victims. “Let’s get a grip here, shall we? True enough, they were civilians of a sort. But innocent? Gimme a break,” he wrote, “They formed a technocratic corps at the very heart of America’s global financial empire–the “mighty engine of profit” to which the military dimension of U.S. policy has always been enslaved—and they did so both willingly and knowingly.” The men and women killed in the World Trade Center, he declared, were “little Eichmanns” who deserved their fate. This essay resurfaced a few years later, and in the firestorm, Churchill lost his job. Somehow, I doubt Rosenbaum will lose his job, despite making similar comments for a much larger audience, which gets to an important fact about this logic. It’s only inexcusable when applied to us or groups we can identify with. When the targets are more marginal, or even foreign, the outrage is strangely silent.